Having worked on the Integrated Enquiry Platform (IEP) project since the start of 2013 I would like to take this opportunity to pen this blog so that I can share some of my views and experiences of the many changes I’ve seen in the way that I now work, as well as the various things that I have learnt since being a member of an Agile project. Having worked at the DVLA for over 9 years I have been involved in various projects in which I have undertaken numerous roles, but the majority of my career has been spent being a tester in the Agency’s User Acceptance Testing team. After being given the opportunity to become the Agency’s first Agile Tester, I can’t deny that I was very excited for the challenges that lay ahead. Having already done some research into how testing using the Agile methodology differed to the conventional method that I was accustomed to, I was raring to go. One of my first tasks in my new role was to pay a visit to Companies House to see how they had adopted Agile within their project areas. 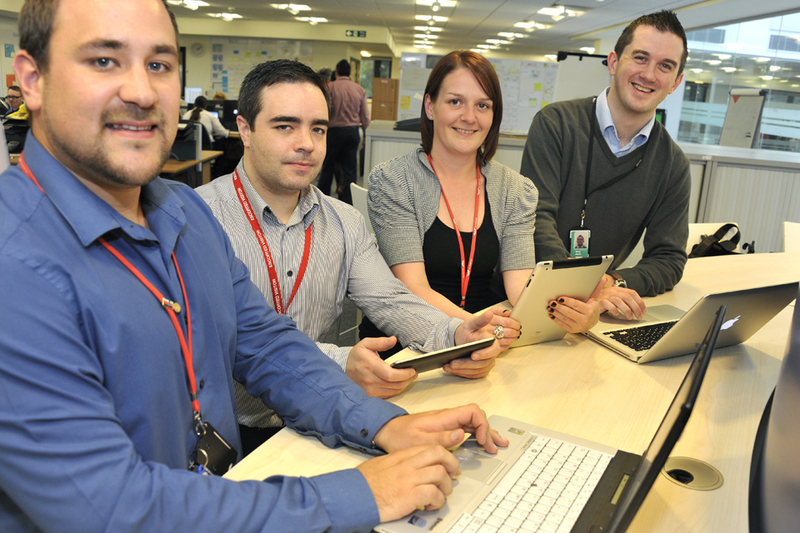 Instantly I saw a vast difference to the way we worked here at DVLA: to witness teams working together with a mixture of business analysts, developers and testers on the same bank of desks was an entirely new concept to me! I was, however, able to learn from this visit and upon my return to work, set about assisting in the smooth transition into the Agile environment. One of the first changes that we introduced was co-locating and so far, this has worked well for us. I no longer have to schedule meetings as far in advance as a week or wait to discuss any problems or issues that arise. Now I can simply swing around in my chair and have a conversation with those sitting around me! Being able to identify issues, resolve problems and spot any missing User Stories well in advance of the code being cut means that problems are resolved, and in an environment such as this, where time is sparse, it makes all the difference. I’ve found that working in an Agile way has offered me opportunities to learn and develop my skills in so many ways. I have now completed the scripting and set-up of our automated test packs, successfully carried out the important security testing that’s needed, written and reviewed User Stories and Acceptance Criteria, and taken on the role of Scrum Master (conducting the daily stand-up meetings and lead the retrospective ceremony). The great thing about this project is our willingness to share our knowledge. I have seen first - hand what challenges the developers face when writing code and have learnt a great deal from them when writing test data or reviewing stories as well as pairing with the business analysts to create user stories and understand how their process work. I have now written a user story and acceptance criteria that has been delivered in a sprint, so learning and developing myself and making the team cross skilled is a key part of Agile. My next plan is to try and learn a bit more of the coding, and hopefully one day write my own code. As communication on the project is key I feel that I should mention the enhancement in the interaction we now have with the business as a whole. A key part of the process is to demonstrate to others how we are working and what we have developed to date. This includes trying to impart our knowledge of the agile methodology and the interest that has been shown in the project has been immense. Recently I successfully introduced ‘viewing’ sessions for my User Acceptance colleagues. These sessions included a visit to our testing area where they were able to see me and my fellow testers ‘in action’. By providing this first-hand insight into agile testing and by observing the processes that we are using allowed us to transfer knowledge. Not only have these sessions proven popular with colleagues but in some cases they have adopted certain principles themselves when testing their systems! I honestly feel that my time on this project has enabled me to really get to the heart of, not just testing, but to the roles that make our project what it is: successful. I’m sure you have seen the blog written by Sarah ‘A day in the life of an Agile tester’ and can see how enthusiastic and dedicated we are when testing this product. I can honestly say that I have never enjoyed my job as much as I currently do. Great blog Paul. Great to see that testing is now a part of development as opposed to a sign off mechanism which it's been for so many years. Good to mention comms too. Let us know if we can help! I have read your blogs with intrigue. I used to work at the DVLA as a tester, and this level of working shows the long way that has come since my day of using word! I work now for a company that specialise in project management and I have found very similar results. Keep up the excellent work there, keep on striving for that change and improvement, and I am sure the results will show in the end product. Well done to all, DDATT. I'm enjoying reading these blogs and found one on agile testing really good. It is good that you share your experiences. I've tried sending a comment so sorry if this duplicates. I am working on a team that currently uses waterfall methods of project delivery. My portfolio is to bring in a change where we aim to merge developers with testers and implement and agile type of approach to the majority of our work. I note that you have similar issues and I am keen to establish how you have overcome issues. Mainly how did you overcome convincing the team of a new approach when our existing one works. Thank you for your comments. Within the DVLA we are using members of the current test team, who work with a waterfall delivery method, on the new Agile team. This enables us to directly report back to the team with regular communications, demonstrations and discussions. This way we have been able to engage with the team and show first hand some of the benefits. The testers on the new team volunteered to come into the agile way of working and were keen in the process, so there was no need to do much convincing! As I described in my blog I have been able to develop my skills and use different types of tools and ways of working, so there are plenty of benefits and ways to show testers how much of an opportunity Agile can be. I wish you the best of luck in your project. Excellent blog Paul, it's great to see that the Agile approach is working for both you and the team. What an interesting read. I too have enjoyed all the blogs and am an agile tester myself. Having read this blog and the previous one regarding testing this way I am pleased that so many companies are now embracing this method of testing (and you seem to be enjoying your work judging from the happy smiles in this photo!). The results are already evident going from your comments and you will soon see so many more! Good blog Paul, I enjoyed reading it and I can see your dedication and commitment to this project showing in the blog. I hope you and the team keep up the good work!